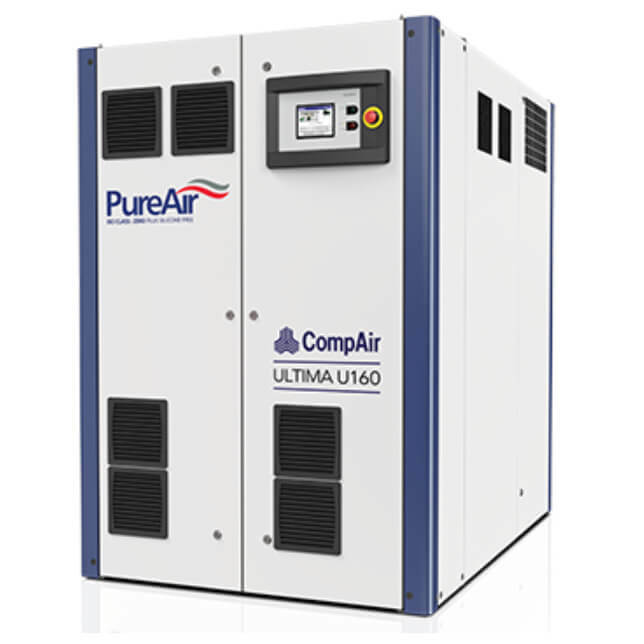 Ultima is a groundbreaking oil-free PureAir compressor. 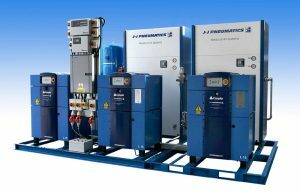 The unique design of this all new compressor range from CompAir, utilises a low pressure and high pressure dry screw airend - each airend is individually driven by a variable speed, permanent magnet synchronous motor, offering exceptional levels of efficiency versus traditional oil-free technology. 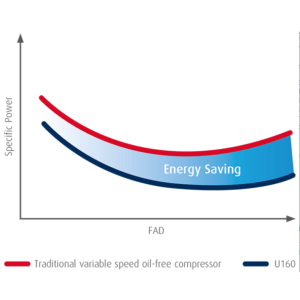 Considering that the highest cost in the lifecycle of a compressor is the energy to run it, the unique design of Ultima has allowed us to combine the ultimate performance with the ultimate efficiency, and still deliver a footprint 37% smaller than a conventional two-stage oil-free compressor. Download the CompAir Ultima Series Compressors PDF. 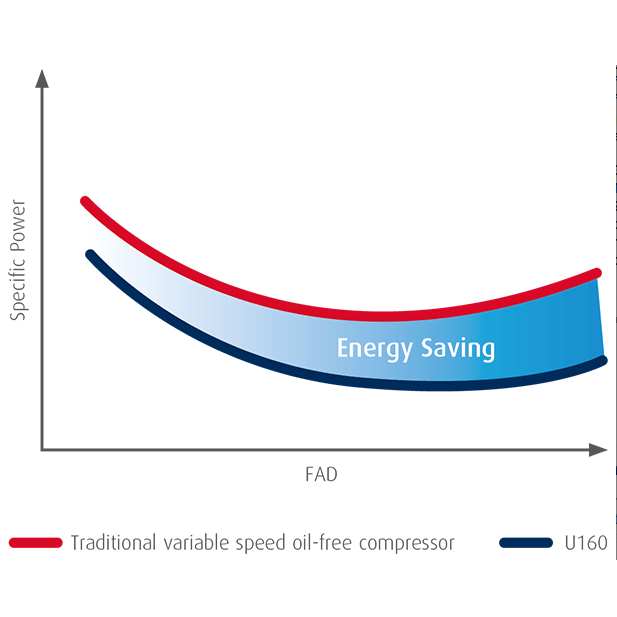 The Ultima compressors are 100% oil and silicone- free and meet ISO 8573-1 Class Zero (2010), making them the ideal choice for stringent oil-free applications within food and beverage, pharmaceutical, electronic and the automotive industries. Ultima contributes to bottom line cost savings in many ways. Not only do they deliver outstanding efficiency and significantly lower lifecycle costs, the Ultima requires on average, 3.4 m3 less space (or up to 37% less floor space) than a conventional two-stage oil-free compressor. This allows easy installation in the smallest possible space - not only a benefit where space is limited - it also translates into property cost saving. Traditional oil-free compressors are driven by a single motor using a gearbox which in turn, drives both the low and high pressure airends. Gearboxes require oil and create friction which equates to energy loss. 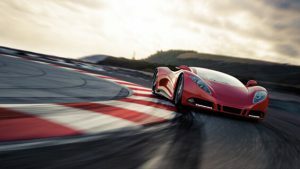 Ultima uses ultra high efficiency motors which replace the gearbox and the single motor which optimise performance throughout the complete volume range, as the airends can be driven at different speeds dependant on the demand. With a single motor driving both airends together this is not possible. This is where Ultima is hard to beat. The Ultima design utilises an intelligent "digital gearbox" design which continuously monitors and independently adjust the speeds of each airend, ensuring maximum efficiency and pressure ratios at all times. When any regulated speed compressor gets to the minimum speed, it goes into idle run. For any compressor, this is wasted energy. Ultima uses 45% less energy in idle run than a conventional two-stage compressor and a 160kW compressor uses only 8 kW in idle run. The Delcos XXL with its high resolution 8-inch colour touch screen display, is extremely user-friendly and self-explanatory. All functions are clearly structured in five main menus and are intuitively visual. The multilingual Delcos XXL control system ensures reliable operation and protects your investment by continuously monitoring the operational parameters, essential for reducing your running costs. Ultima, through the controller, is iConn-ready. iConn is the all new and smart, proactive real-time monitoring service that delivers in-depth and real-time knowledge on the system to our compressed air users. It enables accurate production planning and total peace-of-mind protection, generating insight and statistics that keep users informed on performance, at the same time highlighting potential issues before they become a problem.